In the last few years, a very clear link has emerged between various good performances on University Challenge and participation in the British quizbowl circuit. Alexander Peplow is a member of UK Quizbowl who made it to the finals of the 2017-18 series as part of the Merton College, Oxford, team, and in this column he explains how playing quizbowl can improve your chances of making it on the show, and doing well on it. So you want to win University Challenge? The 2016-17 series final had a strong quizbowl cohort on each of the teams. Perhaps unsurprisingly, we think that the biggest help you can have in this is quizbowl. And why wouldn’t it be? After all, it and University Challenge are siblings, deriving from the same original programme. To do well at one is help towards the same in the other. This can be seen in the fact that, of the 40 people in the last five University Challenge finals, 31 of them had played quizbowl in some form or another. 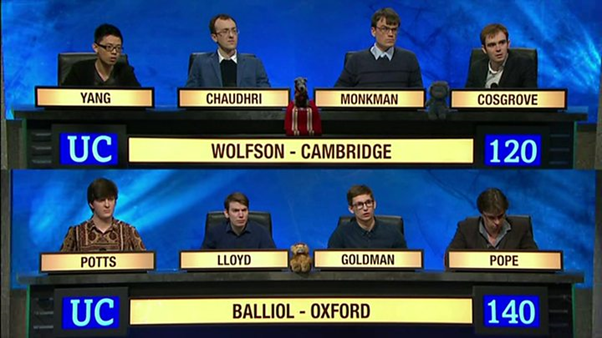 In the 2017 final, every single member of the Balliol and Wolfson team had played quizbowl before. 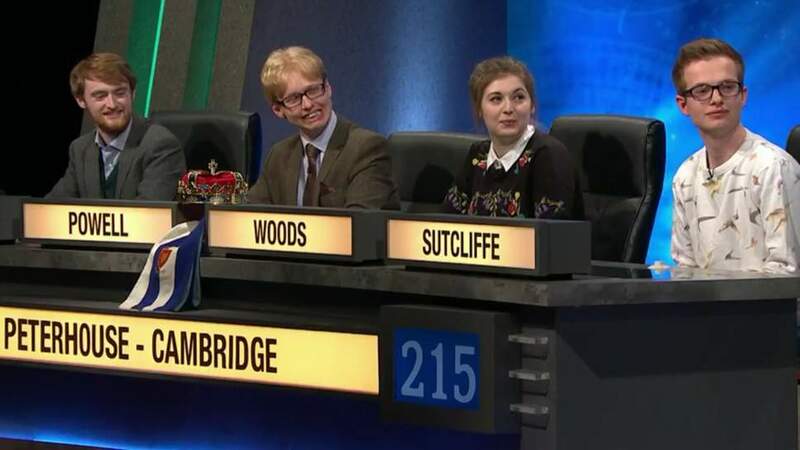 Further, almost every team that has made it to the semi-finals of University Challenge in at least the last eight years has had at least one member play quizbowl — only one semi-final in that time has had no quizbowl players on either team. Morley, Binnie, Trueblood, Clegg, Powell, Monkman, Goldman — they all played quizbowl, as did plenty of impressive players who didn’t get to the final. That’s no accident. Nor is it likely coincidental that the universities with the most active quizbowl societies, Oxford and Cambridge, have had a lock on the final for the last five years. As more and more universities get quizbowl societies — Edinburgh (semi-finalists now two years in a row), Warwick, Southampton, Queen’s University, Belfast, Oxford Brookes, Imperial College, London, and more — it can be expected that we’ll see more and more of these teams on University Challenge. Why be left behind? There are three stages to winning University Challenge, and quizbowl can help you with each of them. Team selection varies slightly by institution, but every student union who applies to take part in the series is sent a long set of general knowledge questions, which most places use to run their selection rounds. General knowledge is, as might be expected, the fundamental element in any application for University Challenge. You’re unlikely to get anywhere without it, and so work in this area is foundational for all the rest. This year’s star Jason Golfinos cut his quizzing teeth on the American quizbowl curcuit. So how can quizbowl help you improve your general knowledge? University Challenge likes to bill (and flatter) its contestants as ‘Britain’s cleverest students’. But it doesn’t really test whether you are clever, but whether you are knowledgeable — as well as, in truth, whether you know how to play University Challenge, which isn’t quite the same. It also tests spelling, for little discernable reason. The overlap between University Challenge questions and those asked in quizbowl tournaments is not exact, but is closer than any other quiz available. Quizbowl questions are often longer and more detailed, which is helpful, as you can get quite a lot more information from them which might crop up in a University Challenge question. 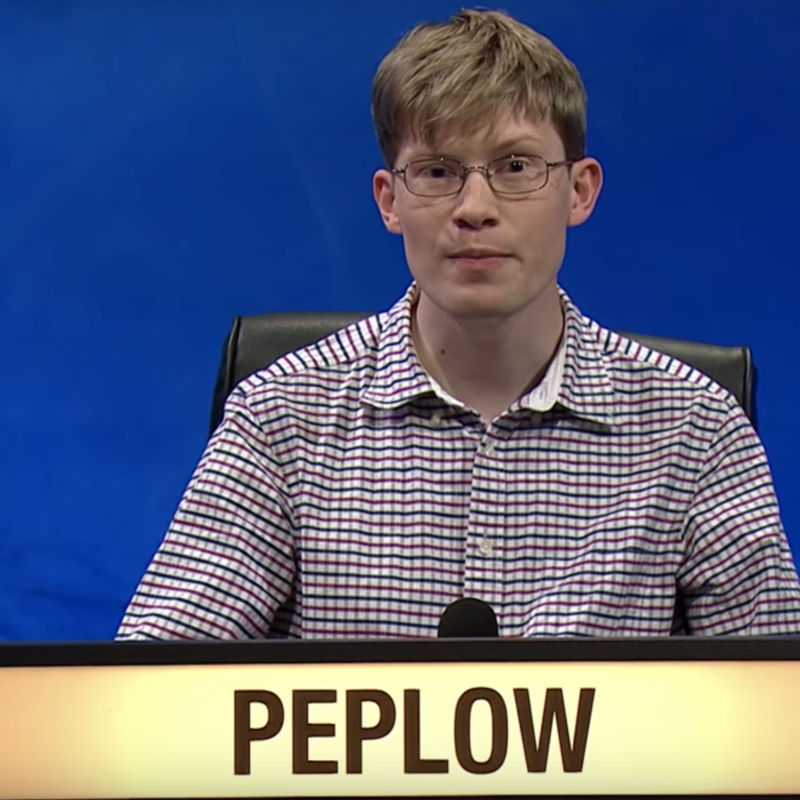 Topics that may seem quite obscure from a first-hearing on University Challenge may turn out to be quite commonplace in quizbowl, such as the works of Pamuk, the Cairo Trilogy of Mahfouz, the Norse god Tyr, or the linguistic theory of Saussure. Quizbowl is an excellent way of getting a preview of the topics that regularly come up in University Challenge, and should prompt you to find out more about things which come up that you’ve never heard of. Pay close attention to questions, even if you don’t think you know the answer — the clues that strike quizbowl and University Challenge writers as interesting are often the same, whether it’s about Costa Rica’s abolished army, Chairman Mao’s mangoes, or the composer Charles Ives working as an actuary all his life. Once Edinburgh’s quiz society started actively playing quizbowl, strong performances on University Challenge followed. It may seem that some people know an impossibly large number of things, but those people almost always started out in a similar position to you. Improving in quizzing is, like improving in pretty much anything else, not a magic art, but the result of work put in. Many of the notably high-scoring individuals on University Challenge — such as Joey Goldman in 2017, or, so far in the present competition, Jason Golfinos — have been playing quizbowl for a long time before their TV appearances. The work you need to do is the reading up on subjects, and nothing and no-one can do this for you, but, at its very least, quizbowl, and the people you meet doing it, should help point you to things which are interesting, and that you want to know, and that can only be useful. It guides you towards a canon that’s pretty much common to them both, and prevents you wading into masses of information that’s actually quite unlikely to be asked about — there’s actually little use learning lists of trivia, such as all the ‘Number Ones’ in a certain year, for information like that is fairly unlikely to come up often. Knowing of something is of much less value than knowing things about it. It’s far better to focus your attention on what is likely to come up, and the best way to find out what this is is through quizbowl. This is probably the most difficult element of appearing on University Challenge. Many good players, and good teams, don’t make it on. Many teams are often made up of people who had tried out before — the members of the 2017-8 Merton team, for instance, had tried out about a dozen times between them. Sometimes you’re just unlucky; there are, after all, only so many teams that can be on in one year. But though there is no certain way of getting past this stage, there are ways of making your application better — and, again, quizbowl can help. The main help that quizbowl can give you at this stage is an idea of how this is a team game. This is a very important aspect of University Challenge, which can be lost in much of the media attention, which so often focuses on individuals. Charlie Clegg’s quizbowl experience helped propel St John’s College, Oxford, team to the 2015-16 series finals. The selection at this stage is done with explicit reference to how you work as a team. There’s another set of questions to answer, which are harder and more specialist than the initial general knowledge test. This test highlights how important it is to get a balance of knowledge on your team. People with a very wide range of knowledge do exist, of course, but it’s very risky to rely on them carry the team — one off-day, and your TV career is over. To get a balance of subjects may mean that you don’t actually take the top four people that apply, since those people might overlap in the same subject area. Doing well on the initial test is only a rough guide to someone’s general knowledge, and gives little indication of how even a good generalist will do as the questions become more difficult later in the competition. Once you are a team, playing quizbowl can help you get to know your strengths and weaknesses, can mark out who it is that you can rely on for certain topics, and can reveal depths of knowledge that you might not expect. Knowing your team well is of great help in knowing when, and whether, to buzz in for starters — when you need to guess, and when you need to leave it to the member of your team that will know for sure. And if you start going to quizbowl practices, and even tournaments, as a team, then you’ll all improve together, getting different things from it that your teammates miss, or don’t focus on. This is where quizbowl is of most use, for it allows you to practise the game. What other competition would you expect to win simply by turning up on the day and winging it? Playing quizbowl gives you experience of playing an almost identical game, with similar rules and pressures. You can play, at most, eight University Challenge matches — there are more than that in a one-day quizbowl tournament, so there’s plenty of opportunity to get practice at playing matches. Knowing the answer, for instance, is one thing — learning the courage to buzz is quite another, and much harder to learn from browsing Wikipedia. Most University Challenge and quizbowl questions are answerable by the time you get to the end — but you don’t normally get to the end, so the art of buzzing when you’re almost sure, and then actually following that up with a correct answer, is an important one to master. Moreover, if you attend quizbowl tournaments, you’ll probably play against people who are playing, or have played, or perhaps have even won, University Challenge. You’ll find out what it’s like to play against people who may be much more knowledgeable and experienced than you and your team are. But they all started off somewhere, and testing yourself against other people is the way to see how well you’re doing, and what you need to work on. Shouting out answers at the television is all very well, but it doesn’t compare to a live situation. 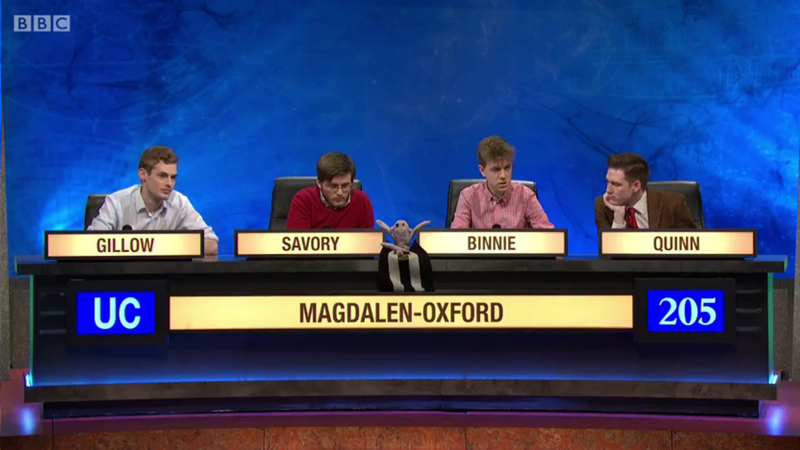 Hugh Binnie, the captain of the memorable 2014-15 Magdalen College, Oxford, team, is not only a connoisseur of modular arithmetic, but a quizbowl enthusiast, too. Quizbowl will also help you with speed, particularly in conferring. Despite his warnings to the contrary, Jeremy Paxman is often extremely lenient with timing. Quizbowl tournaments, by contrast, have strict five second time-limits on conferring. The extra time in University Challenge seems like a good thing, seeing as it gives you more time to pull out an answer from the back of your mind. But often the time taken to do this far outweighs the five points you might get from it, and, fairly often, University Challenge teams spend much too long trying to answer questions that they have no idea about. This isn’t to say that you should pass every bonus question, but there’s simply no point hanging around on something you’re not going to get, or won’t get within a few seconds — best to move on quickly to something that you might. Matches are almost always won on the number of starters that you get, not bonuses. This is something to especially remember in first round matches, where there’s the chance of coming back as a high-scoring loser — the faster you go, the more questions are asked in an episode, so the more points it is possible for both teams to get. Quizbowl games should teach you the discipline of thinking quickly and using your knowledge efficiently — invaluable in University Challenge, where each match could be your last, and there is no learning curve. Winning the final, of course, is something that really depends on the luck of the questions you get, and holding your nerve. By that point, your opponent will, by definition, be a team just as good at University Challenge as you are, and, by the evidence of recent years, almost certainly will have played quizbowl — don’t put yourself at an unnecessary disadvantage! This whole process for next year’s competition will be starting soon, so why not try out quizbowl at one of our upcoming tournaments in Oxford, Edinburgh, or Warwick? Contributing writer; 2017-18 University Challenge finalist for Merton College, Oxford.